I Hope everyone is enjoying a safe and happy Memorial day. On this Memorial Day, I would like to take time to remember THE many brave men and women who served this country with such honor. In many cases, they made the ultimate sacrifice so that we may enjoy the freedoms that we do. THANK YOU. 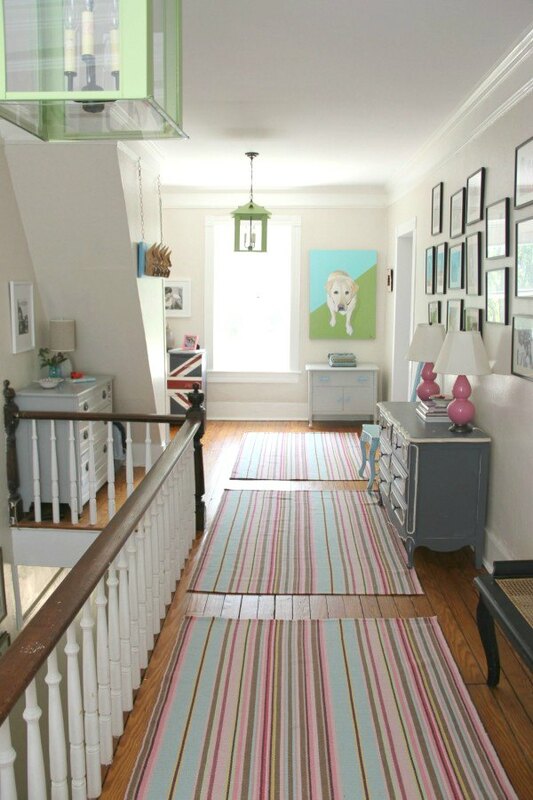 The IN OUR OLD COUNTRY HOUSE, the Upstairs and Downstairs Hallways function as actual ROOMS, not just passageways. Old Homes are not known for their abundance of closets…in fact…we have a whopping total of 4…and the PLETHORA OF DRESSERS…IS MY CURRENT SOLUTION TO THE LACK OF CLOSETS. The Upstairs DRESSERS serve as Storage for all the items; sheets, towels, off-season clothing, sports clothing, old photos and craft supplies, etc…things that would go in closets…if we HAD closets.I am not in love with 4 dressers..but they do the trick and it is all about affordable solutions to me…all 4 of those dressers total cost me $200…and they are painted as none of them were in the best shape when I got them. I would love to refinish the Cherry Eastlake one (left) but the rest really are not worth the time. Truthfully…My dream is to take this wall on the right (above) and do a wall length series of built ins, shelves and some hanging space and maybe even a desktop for one of the kids…but alas, this dream may never come to pass…but HEY…I CAN DREAM! The Ceilings, which had collapsed a year ago… were replaced this Spring with fresh drywall and Crown Molding was installed. 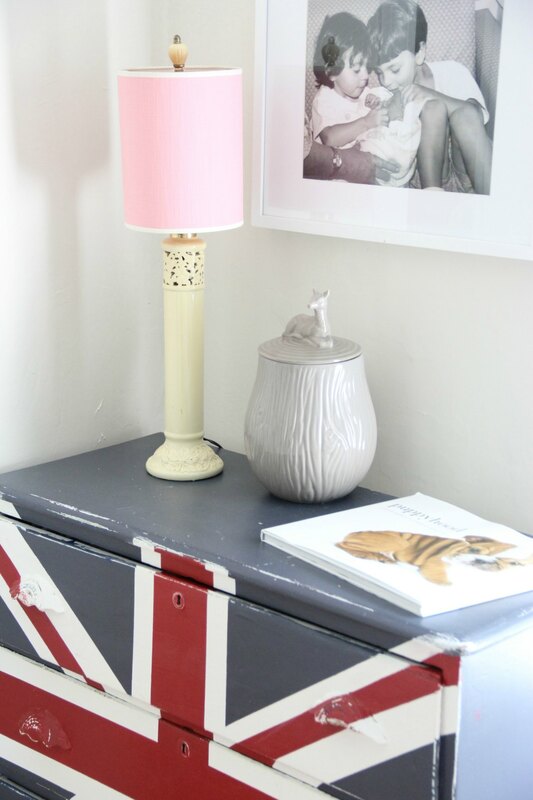 We painted from the Crown to the Picture Rail the same color – Benjamin Moore “Mountain Peak White”. Walls-Maritime White . Charleston lanterns From Shadesoflight.com and spray painted Grassy Green. Robert Abbey Double Gourd Lamp in Schiaparelli Pink. One of my best friends gave me the blue chairs. If you look closely and the closer one…you can see where her daughter ‘Abby”, wrote her initials…when she was learning the alphabet…. RUGS: Dash and Albert “Jamaica Ticking”…a discontinued pattern…20% off. “TREVOR” – Yellow Lamb, painted by me. 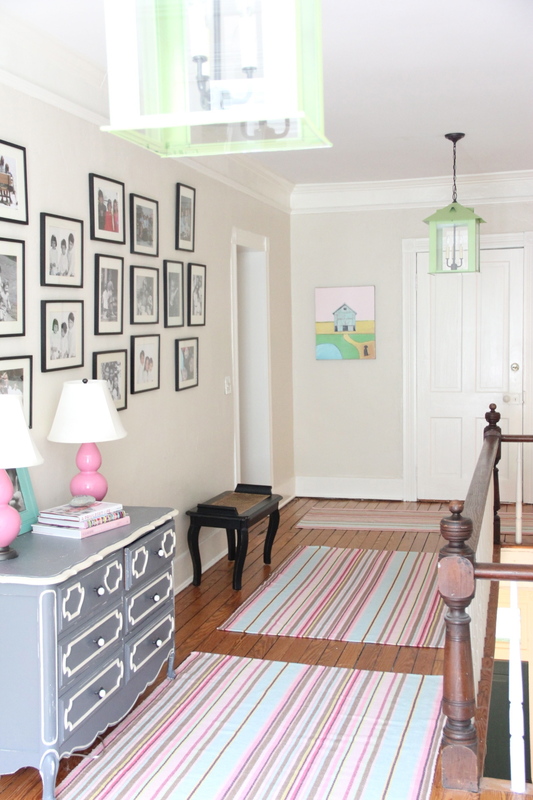 The Upstairs Hallway is fresher…cleaner and most IMPORTANT – safer! 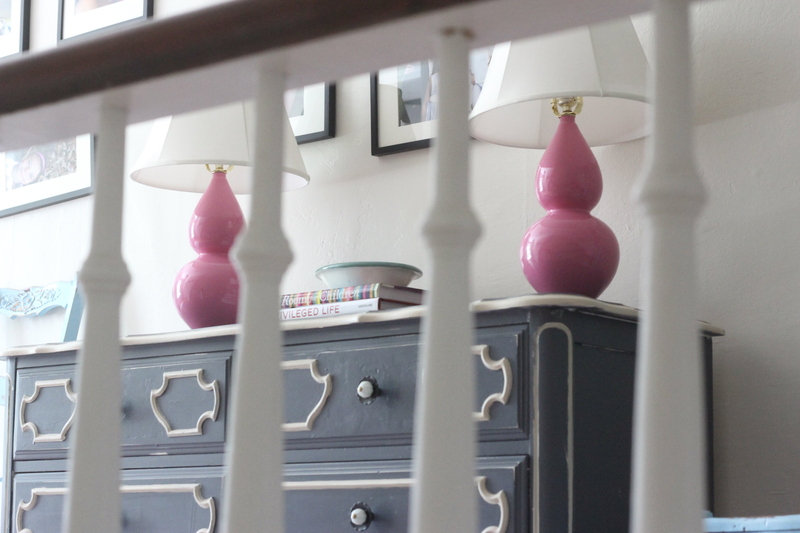 Now that we have nice new ceilings…I purchased only the Lanterns and the rugs and the rest was just Refinished and or RESTYLED…and now…I no longer avoid going upstairs…. your home looks incredible!!!!!!!!!!!!!!!! it’s got to be a wonderful feeling having your upstairs hallway back!! Thank you and Yes…it IS wonderful to have it back!!! 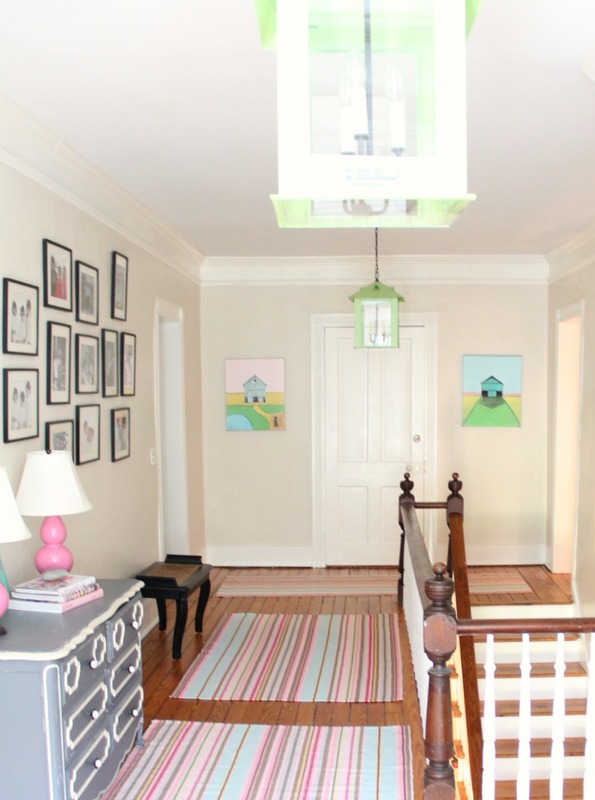 Your hallways are beautiful and so functional! Your home is a DREAM!! I cannot say enough how lovely it is and I adore your personal style and amazing art talent. Amy, a very belated Thanks for your kind words. I hope you have had a nice summer! It is beautiful. So light and bright. The rugs are my favorite. Thank you Theresa, I am quite fond of the rugs myself! So very pretty and inspiring! 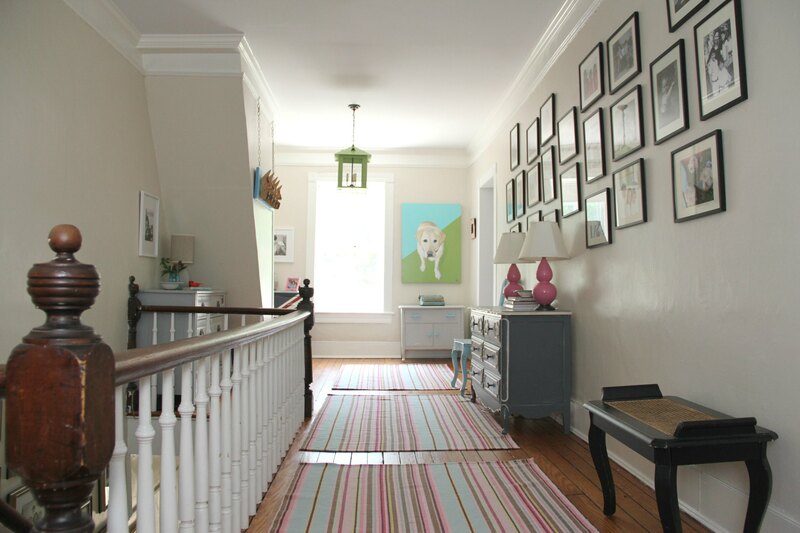 I love the colours you have used and your beautiful paintings really make this space. I would love generously sized halls like yours and you are right that they are more like rooms than simple passageways.